LAPL: Widening of Victory Bl. at Columbus Ave. 1955. 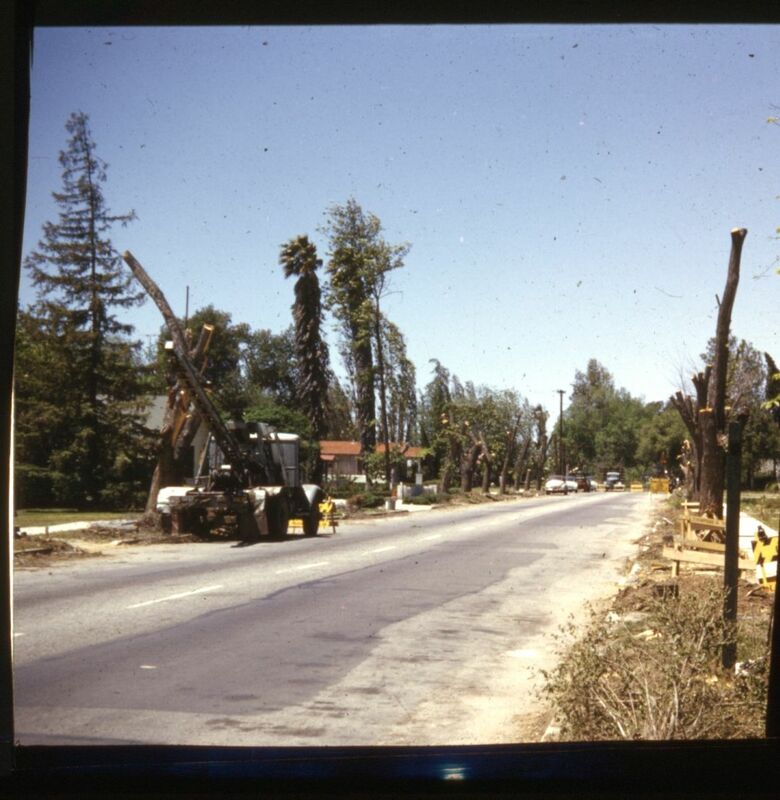 In 1955, pepper tree lined Victory Blvd. was widened to six lanes, three in each direction. The trees were chopped down, and soon multi-story, dingbat apartments replaced houses and garden apartments along most of the street. It was done in the name of progress. In that era, almost all public works were thought to be “progressive” or in the best interest of the people. In a few years, the 405/San Diego Freeway would cut through Van Nuys, not far from this photograph, and the area would become the car-centered, sprawling place it is today. The Greatest Generation, those men and women who settled here after WWII, fervently believed that Los Angeles was the city of the future because it was mobile. The biggest parking lots, the most freeways, the widest boulevards, the least of amount of public transportation, those were the goals. 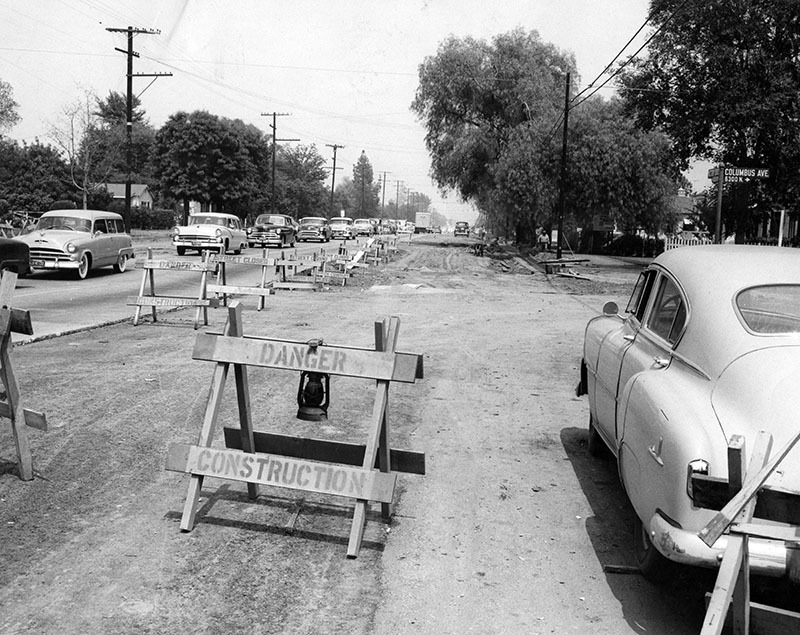 In 1955, the widening of Van Nuys Blvd was also underway. The streetcar tracks were ripped up and diagonal parking banished. The new street would also be six lanes of traffic. 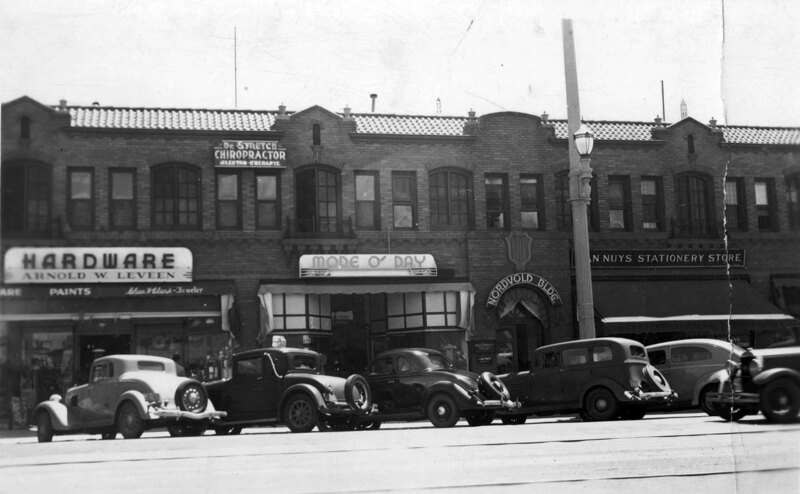 But the old Van Nuys, seen below, seems to have been a nice place to work, shop and hang out in. Why was it so necessary to destroy it? Some have commented that this blog focuses on dystopian ideas about Van Nuys, presenting the community as something dysfunctional and lost. But there is another purpose to Here in Van Nuys. The philosophy behind it is to explore the past and use it as a guide for where we should, and should not go. Our concepts of bettering the community will hopefully lead us into a more walkable, civil, clean, cultured and dynamic one. 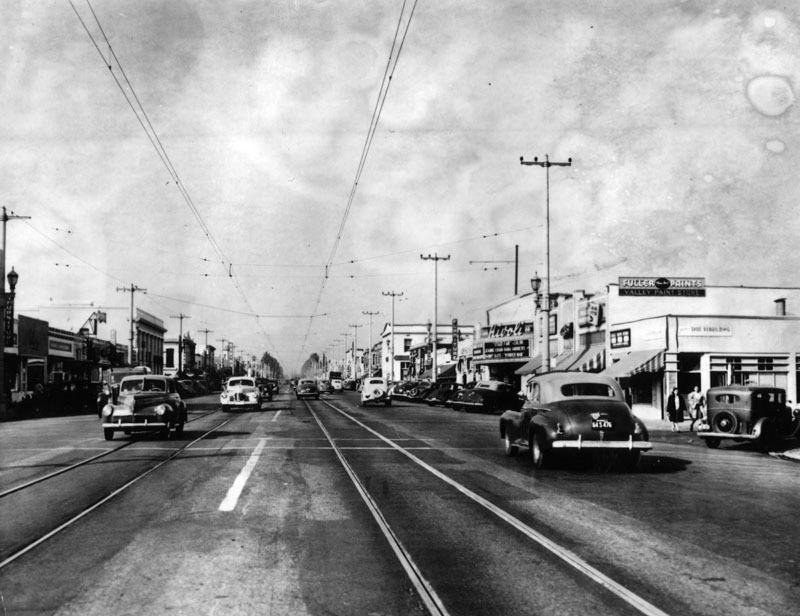 We moved to Van Nuys in June 1955 when I was 8 years old. I was unaware of the changes being made to Victory and VN Blvd at that time. However, within a couple of years I became aware of the Rivoli Theater, which you show in one of the pictures. It was at 6258 Van Nuys Blvd, between Sylvan and Erwin. It showed all the horror and science fiction movies that we kids wanted to see on Saturday afternoons, probably for 25 cents. (Candy bars were 6 and 12 cents but we’d smuggle candy in from local drug stores, where we only paid 5 or 10 cents.) It was a little worse for wear – I’ll never forget the socks dangling out of the light fixtures and the sticky floors. Still I have many fond memories of the Rivoli.